To start our final programme of the 2009 trilogy, we visit the New Territories where we get on board AVBE43 (MW 2917) a KMB Volvo Enviro 500 on the 60X service at Jordan Bus Station for the long journey to Tuen Mun. On our arrival our filming begins at the exit to the busy bus station where we see vehicles from the fleets of KMB, Citybus, Long Win and the former KCRC fleet now branded as MTR. From here we continue north to Yuen Long. Here the Light Rail runs on reserved track through the main street. We film these vehicles along side the many buses that traverse this road. The second location in Yuen Long is Kik Yeung Road that is also home to one of the bus stations in the town, and it is here we board a short Dennis Trident of the KMB fleet, ATS70 (KC 8296) on route 64K for a ride to Tai Po. The main street here is an excellent location to catch the buses in action. Both air-conditioned and non-aircon buses are captured on this busy street. Not far from this location is Tai Po Market which has a covered bus station. Here we see brand new MTR Enviro 500s in the new dark grey, red and white livery along side similar vehicles in the standard dark blue, red and grey scheme, as well as a good variety of KMB buses. Our next location is the upper bus station at Sha Tin where all three main Hong Kong operators are featured. Mostly KMB where nearly all current types are represented. We then move to the massive underground bus station at New Town Plaza to observe the evening rush hour – which is quite a sight as the vehicles race through taking their passengers home for the evening! A change of mood follows with a ride on a KMB non-aircon Dennis Dragon S3N303 (FY 3401) on route 74A to Tia Po. In comparison our next ride is on another KMB non-aircon vehicle. 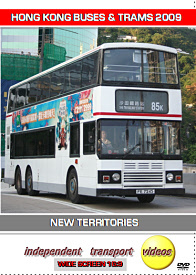 This time a Leyland Olympian, S3BL447 (FV 5827), on the 39A service to Tsuen Wan. On arrival we film all the action at the end of the morning rush, again featuring most types of KMB buses. Our final ride is back to Mong Kok on board KMB S3N327 (FZ 6940) a non-aircon Dennis Dragon.